Wednesday 5th December (where did that year go!!!!) – Australian Market Wrap | Beeks Downunder-Because not all financial news is boring! High 5692 Low 5610 Support tested again. Held. Banks and financials bear the brunt. Big iron ore miners support. Staples up on defensive buying. USD earners suffering as AUD rallies. CSL sneezes on vaccine update day. GDP disappoints. Big moves in bond markets. Rate cuts now on the table. Aussie Gold firmer at $1691. TME +3.51% another bid around 610c. Opens books. TPM +0.68% bucks trend on chairman’s comments. LLC -3.18% takes another leg down. COL +2.87% finally some buyers. ING +2.06% new hatchery plan. LYC -22.41% now where to put that waste. Always something. QBE -4.75% lower US bond prices. Curve issues. ALL -4.36% still coming up lemons. NEC -7.95% media speculation on radio buy out. FBR -15.15% Caterpillar pulls the pin. CEO says it’s not personal. MRN +12.57% speculation of a radio sale to NEC. ELD -2.70% starting to look interesting. Time for a nibble? ORE -1.81% downgraded by Macquarie. Speculative stock of the day: Ultracharge (UTR) +50.00% after announcing an agreement to supply lithium-ion batteries to a three-wheeled electric scooter maker, Roadbix Urban Transportation. Biggest Risers – SKT, TME, COE, APA, AMI and COL.
Biggest Fallers – LYC, NEC, ASL, EHL, SVW, RWC and HUB. Trade Me Group (TME)+3.51% Received a non-binding, indicative takeover proposal from Hellman & Friedman at NZ$6.45 per share. Apex Partners is currently undertaking due diligence on an exclusive basis following its preliminary proposal announced on November 21. Apex Partners offered NZ$6.40 per share. MYOB (MYO) –0.86% Newswires this morning suggesting that KKR is looking at funding options for the MYOB acquisition as it completes due diligence. MYOB is supposedly looking for a bid of at least 377c per share. The stock closed down 0.3% yesterday at 350c. Bank of Queensland (BOQ) -1.31% CEO Jon Sutton resigns due to health reasons, COO Anthony Rose appointed acting CEO. CSL Limited (CSL) – 1.12% R&D investor briefing. Presented new data showing that its flu vaccine (QIVc) was 36.2% more effective than standard egg-based quadrivalent vaccines (QIVe) in the 2017-18 influenza season. ASX Limited (ASX) –1.69% reports November activity. Volatility 0.6% vs prior month 0.7%. Expected future volatility (as measured by the S&P/ASX 200 VIX) decreased to an average of 16.2 vs month-ago 16.4. Listings and Capital: Total capital raised $23.24bn vs year-ago $7.38bn. Cash Markets: Average daily number of trades +17% y/y. Average daily value $4.66bn vs year-ago A$4.21bn. Futures & options: Average daily volume+15% y/y. TPG Telecom (TPM) +0.68% AGM today. TPM notes FY19 year-to-date results are tracking well to guidance provided back in September 2018, adjusted EBITDA is expected to be between $800 and $820m and adjusted capex is expected to be between $180 and $220m. Telstra (TLS) +0.33% 5G update. CFO Robyn Denholm reaffirms FY19 guidance. Capex remains within the full-year envelope and restructuring costs in the first half are tracking along with expectations. 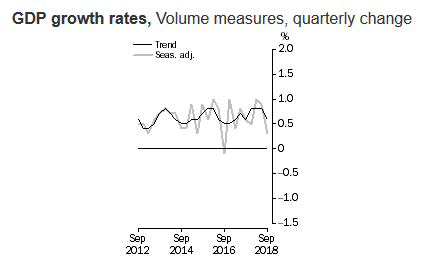 GDP – The Australian economy grew 0.3% (forecast of 0.6%) in seasonally adjusted chain volume terms in the September quarter 2018. This is disappointing and the RBA was expecting more. Yearly GDP is now running at 2.8% rather than the expected 3.3%. The Australian dollar has fallen to just above 73c on the numbers as rate rise forecasts ease. Not a great result. Cash-rate futures priced out any chance of an interest-rate increase through September next year and there’s now a less than 50 percent chance of a hike in 2020. You can see why international investors see a slowing economy. The Australian economy grew by 0.3% in seasonally adjusted chain volume terms in the September quarter. 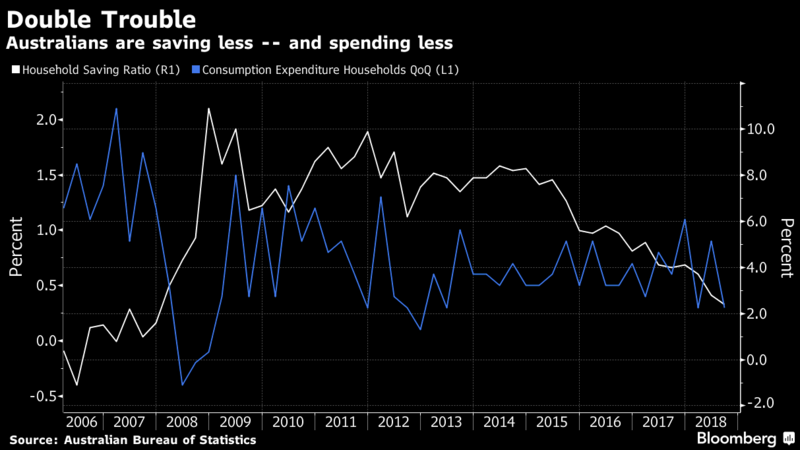 Household final consumption expenditure increased 0.3% during the quarter contributing 0.2 percentage points to GDP growth. Compensation of employees increased by 1.0%. Net exports contributed 0.3bps to GDP growth driven by a decline in imports. The terms of trade rose 0.8%. GDP Data pushes Dr. Shane Oliver to forecast two rate cuts next year. Plot twist. RBA in denial. Big day for a change. GDP miss the key. China says it will quickly implement trade agreements with the US. Confirms 90-day deadline. Growth in Japan’s services sector was steady in November after rebounding to a six-month high in October. 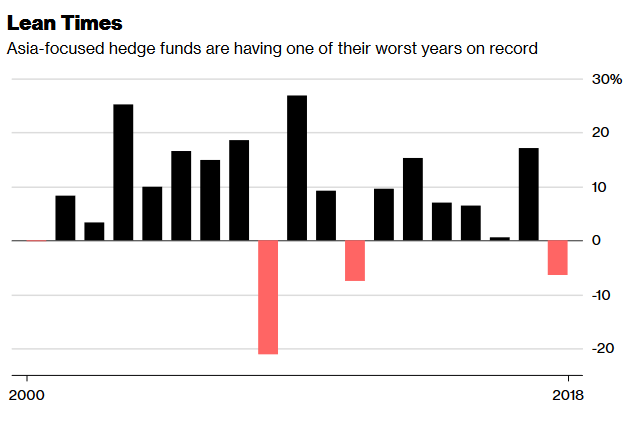 Asian focused hedge funds are having a tough year. Almost 72% of funds with double-digit 2017 returns now in red. Huawei is set to unveil a 3-D camera phone. Apple not even making a 5G phone to begin with. George H.W. Bush funeral today – US markets closed. Flynn to be spared prison time as recommended by Mueller. France riots over fuel. Frances fuel tax gets suspended. Too late. The UK stays mum over Brexit. Stiff upper lips all around. Fred and Harry emerged from the clubhouse to tee off at the first, but Roger looked distracted. “Anything the matter, mate?” Harry asked.